Apple cider vinegar (or ACV) is made from apple cider that has undergone fermentation to form health-promoting probiotics and enzymes, giving it significantly less sugar and fewer calories than apple cider or apple juice. Apple cider vinegar known by many as a natural cure-all for a multitude of conditions. helps lower the body’s storage of fat. For weight management, you would take 1 capsule right before your main meal every day. For general good health you can take 1 or 2 capsules through out the day. For best result you can add honey. This product is intended to be used with the companion diet plan and a daily exercise program. Individual results may vary. Please take as directed, if you experience any side effects you must stop taking right away and consult your doctor or health care professional. 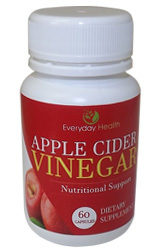 These capsules contain 100% apple cider vinegar (Mother included) that has been powdered and concentrated. 1 Capsule is equivalent to 3 teaspoons of liquid vinegar. Each bottle contains 60 gelatin capsules and is a 2 month supply. You should experience no side effects when using ACV, please take as directed. But if you experience any side effects you must stop taking right away and consult your doctor or health care professional. If you have any serious medical conditions or are currently on other medication, you should check with your doctor first.